McKenzie has a new, modern state-of-the-art wood shop that can handle any custom job, from the simplest panel to a full trophy room, with the quality and efficiency that you have come to expect from the leader in taxidermy design and innovation. We have produced a short video to introduce you to the amazing capabilities of this new wood manufacturing facility, which is presented at the bottom of this page. McKenzie is well known for offering the best customer service in the industry. Now you can take advantage of this stellar McKenzie service with any custom woodworking you ever need. The outstanding quality, speed of completion, and pricing structure is without equal in the industry. This 12,000 square foot facility in North Carolina has all of the latest woodworking equipment to produce anything your imagination can conceive. This is not just a guy with a band saw and router. This modern plant is filled with top-end computerized equipment. Every inch of the raw lumber is scanned by Optimizers which use lasers to inspect and remove the less desirable areas. Knotholes or bad spots are automatically cut and discarded. This ensures that all finished items are manufactured from the best grade wood. Six-head CNC routers use computer aided design to cut precision parts with incredible quality and perfect consistency, from the smallest panel to the largest habitat base. McKenzie’s computerized molder is capable of cutting a variety of profiles for bases, furniture, cabinetry, chair rails, base boards and crown molding, so the design of the entire trophy room can be fully coordinated for a stunning cohesiveness. Lasers are used to engrave custom artwork including images, company names, logos, photos or trophy information. 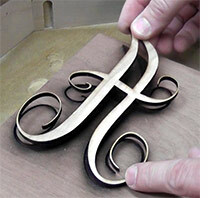 The laser is also powerful enough to cut entirely through the wood to create stunning intricate inlays. Inlays can be designed to sit just proud of the surface as shown here, or designed as full inlays, where one type of wood is flush with another type of wood or material such as mother of pearl. In the spray booth, McKenzie’s finishers are experts in applying beautiful stains and durable finishes. On some woods such as walnut, the finishers will actually use an airbrush on any blonde or sapwood areas to tone the surface for consistent color. Custom pedestals of any size or design, custom panels in any shape including states and countries, custom inlays or engraving; if you can imagine it, the McKenzie wood shop team can build it for you: quickly and inexpensively. You’ve seen the huge variety of beautiful stock wood items in the McKenzie catalog. Hundreds of designs and finishes are available to order right off the shelf, and available for pickup in six regional distribution centers. But you can also modify any of McKenzie’s existing items by changing the size, dimensions, wood, or finishes. You can add personalized touches like custom laser engraving, insets, or accessories. Exotic woods like wormy maple or ambrosia can be used for construction, or you can modify existing designs by adding shelves or doors to pedestal bases. Whatever your client wants, can be fulfilled. Entire trophy room packages with coordinated bases, furniture, molding and flooring can be produced—along with the rocks for mountains—and all delivered on one truck with one call. The experienced staff of wood artists can assist you with your designs and suggest finishes that make your taxidermy displays one-of-a-kind, and set your work apart from the mundane. Each custom project is given the individual attention to detail that will insure success and a satisfied client. Call or email McKenzie with the details of your custom projects and they will get you a quote right away. They will be happy to assist you with your design or answer any questions you might have. The typical lead time is only two to three weeks. When a job is quoted, McKenzie will give you a firm time frame on production. The McKenzie wood shop will save you time, money and aggravation. One call is all it takes to make your custom creations come alive with the beauty and elegance of finely crafted wood. Watch the short video below to get the entire story.